Target Test Prep GMAT Quant is an innovative, ultra-clear and super comprehensive GMAT quant course that's unlike anything you've used before. Taught with unprecedented clarity and details, this course offers serious material to prepare you for a serious exam. Trusted media and satisfied users agree upon Target Test Prep reliability and effectiveness. 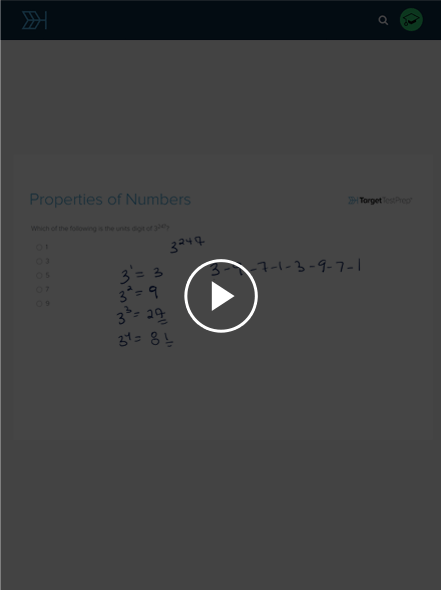 Learn every concept, strategy, technique, shortcut, trick and tip necessary to earn an impressive GMAT math score. Improve your skills with clear, digestible, well-taught lessons, then perfect your new knowledge with customizable practice that simulates actual test questions. Study at your own pace, anytime, anywhere, with a learning platform that adjusts to your specific needs and allows for rapid score improvement. 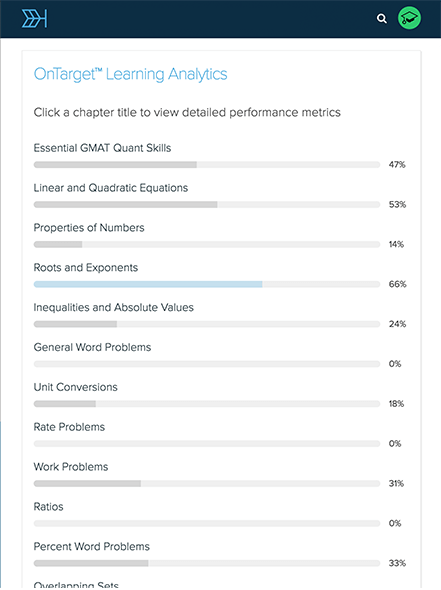 20 rigorous chapters broken into 500+ lessons covering high value GMAT quant topics such as number properties, word problems, and geometry. We place all the content you need to earn an impressive quant score at your fingertips, on-demand. Proper practice makes perfect. 3,000+ realistic quantitative problems covering the most important topics provide ample, targeted practice for even the most ambitious students. Smart learning analytics track your progress, and provide you with intelligent, actionable analytics allowing you to strategically focus your study efforts. Learn concepts, strategies, and techniques required to efficiently tackle any GMAT quantitative problem. Quickly zero-in on your weaknesses and turn them into strengths. 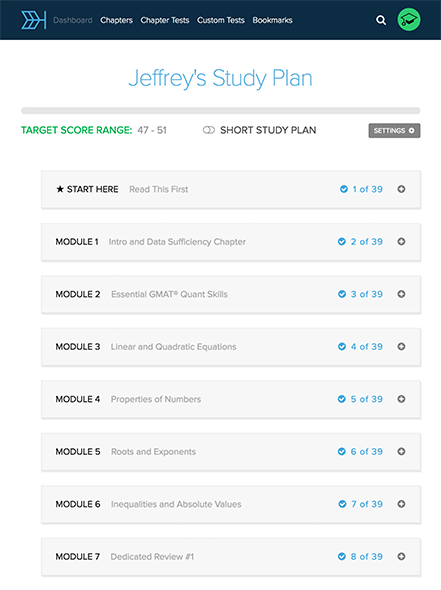 Whether you are just beginning your test prep or a seasoned test taker, with 6 different study plans and adaptable lessons, you can customize the course the suit your needs. 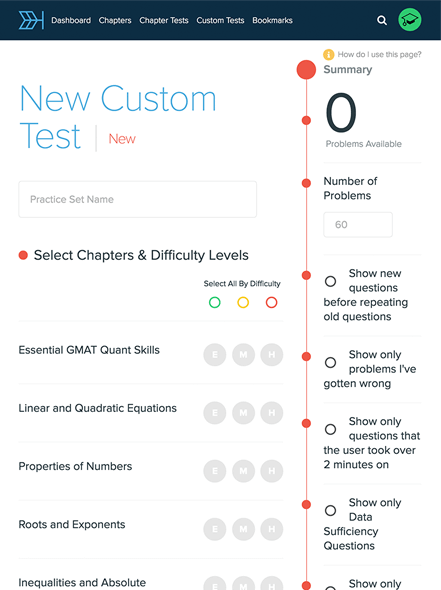 Easily find your weaknesses by taking custom tests, from our database of 2400+ practice questions, mixing and matching questions from any chapter and any difficulty level. Have questions while studying? Need further clarification on something you read? Knowledgeable, friendly help is just a click away. TTP Helped Me Score a 720 on the GMAT. The TTP curriculum is broken down into 20 different modules and includes literally thousands of practice problems covering everything that you will need to be successful come test day. The thing I liked most about the curriculum is how detailed and thorough the explanations and lessons are. Given that I hadn’t dealt with most of the quant concepts in a while, this was a huge plus for me. If I Had to Do It All Over Again I Would Have Started With TTP. Seriously, I have taken EVERY GMAT prep program you can think of and Target Test Prep was the ONLY one from which I gained substantial results. If I had to do it all over again I would have started with TTP and saved myself so much time and frustration. My tutor worked with me from start to finish. He was patient and continuously followed up with me when he could tell I had questions but did not want to ask. He also gave me various resources to help explain concepts I could not understand. My math percentile went from 54% to 70% after taking this prep program. Before Coming to TTP, I Struggled A LOT With GMAT Quant. First started with Manhattan Prep's Quant books, and wasted 4 months on them without any progress:(( And then, thanks to God, I came across TTP and used the free 5-day trial. It changed my attitude towards quant completely. I scored a 710 after some hard work with Target Test Prep. Target Was Instrumental in My GMAT Success. I came to TTP having used multiple other preparation tools. By my second GMAT attempt, I had completed a Manhattan Online Prep course and was still unable to approach my goal score of 700+, a mark I designated as competitive with top programs I aspired to apply to. With the Help of Target Test Prep, I Scored a 770 on the GMAT. My quant increased from 34 (practice test) to 47 (official) after one month of TTP. Highly recommended if you have only a month to study like I did. 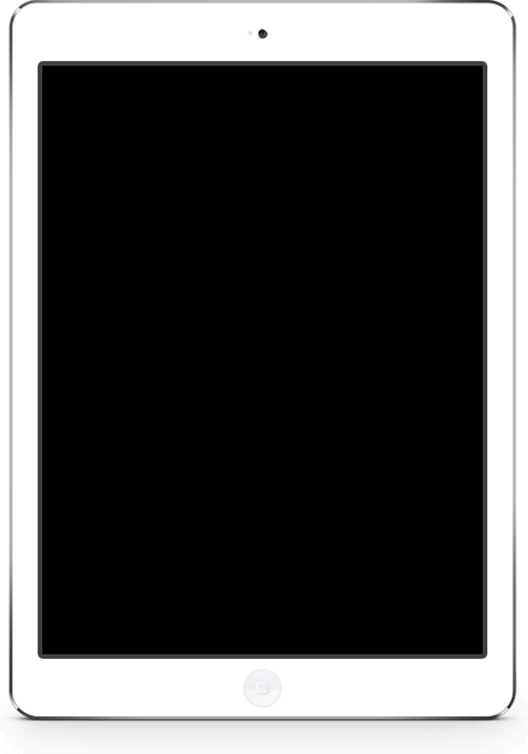 It's self-directed, which I prefer, and customizable, with very clear explanations and tutorials. A+. I didn't pay for mentoring, but TTP still gave me a call after I signed up for the one-day trial. That was SO helpful in answering my ignorant GMAT questions. Scott, Jeff, and TTP are the reason that I scored a 50 on Quant. I have never been a good test standardized test taker, and I tried Kaplan and Manhattan Prep before switching to TTP. No other class or one-on-one tutoring helped me as much as Scott/Jeff/TTP. There material is unique to anything else on the market. The lessons and study plans on the website are interactive and provide insights into the type of questions that no other company can match. I have utilized Target Test Prep, Manhattan GMAT, Veritas Prep, Magoosh and EmpowerGMAT resources over the course of my study for the GMAT. Target Test Prep (TTP) is the single best resource that I used in order to prepare for the Quant section of the GMAT. It is a resource that helped me to crack the 700 barrier that had eluded me for a long time and is responsible for my score of 49 on the Quant section. all I can say is that TARGET TEST PREP FREAKIN DELIVERED! Took the GMAT for a fourth time in May, and stood up and fistpumped (as quietly as possible) when I saw 770 flash over the screen. After spending countless hours studying with little to show for it, the Target Test Prep course propelled me from a Q42 to a Q49 and a 770 overall score. For anyone needing help with Quant, this is your course. We are fully confident in our product. If your official GMAT quant score does not increase after completing Target Test Prep GMAT Quant, request a full refund. This is the GMAT prep course you've been searching for, but don't just take our word for it. 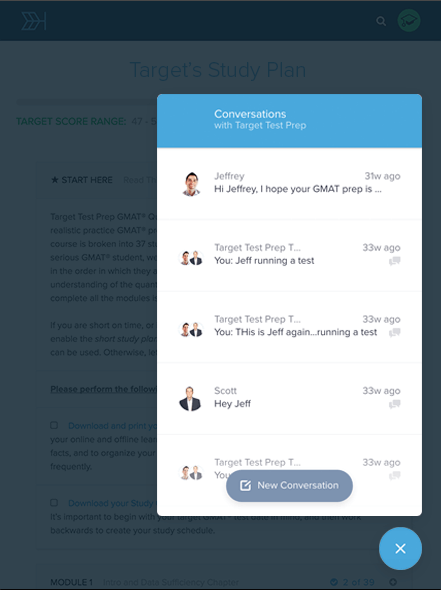 Try Target Test Prep GMAT Quant for 5 days and see for yourself why we're changing the way students prepare for the GMAT. GMAT® is a registered trademark of the Graduate Management Admission Council™. The Graduate Management Admission Council does not endorse, nor is it affiliated in any way with Target Test Prep or any content of this web site.